Republican governors who may run in '16 weigh in on immigration. camera (J Pat Carter/AP Photo) New Jersey Gov. Christ Christie, left, Indiana Gov. Mike Pence, Fla. Gov. Rick Scott, Illinois Gov-elect Bruce Rauner and Maryland Gov.-elect Larry Hogan talk about recent Republican party gains during a press conference at the Republican governors' conference in Boca Raton, Fla., Nov. 19, 2014. 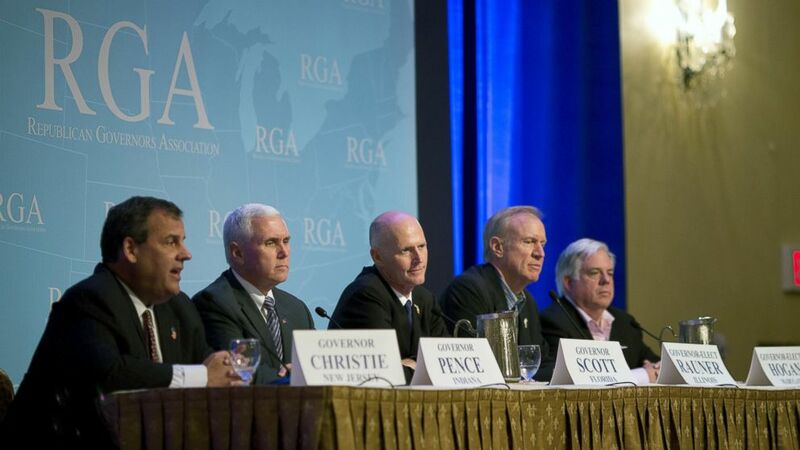 Potential 2016 GOP presidential candidates at the Republican Governors Association annual conference gave very different responses to the president’s decision to announce major executive action on immigration reform Thursday. At the gathering at the posh Boca Raton Resort and Club, New Jersey Gov. Chris Christie dodged, Texas Gov. Rick Perry threatened, Louisiana Gov. Bobby Jindal accused the president of throwing a “temper tantrum” and Ohio Gov. John Kasich sounded a more moderate tone. He did note his work in the state on the issue, including legislation he signed last year that gave tuition breaks to New Jersey residents who are the children of undocumented working immigrants, as well as his opposition to drivers’ licenses for undocumented immigrants. “This is not how the president should be doing this. If he wants change then he should go to the House, go to the Senate and pass a bill changing the law. He’s not the first president to ever disagree with Congress, but he is becoming the first president to consistently throw a temper tantrum and ignore Congress time and time again,” Jindal said in an interview with ABC News. "I think it would be a profound mistake for the president to overturn America's immigration laws with a stroke of a pen," Pence said. “I think the president is taking a major, major political chance with what he’s doing,” Perry said at an RGA session with four other possible 2016ers including Wisconsin’s Gov. Scott Walker, Ohio’s Gov. John Kasich, Pence and Jindal. “He’s putting his party in jeopardy, and I think he’s putting members of the Senate and the House in jeopardy,” Perry said. The governors gathered here are celebrating their recent big wins, including in blue states like Maryland, Illinois and Massachusetts. In January there will be 31 governors in state house across the country, which is the most for either party in 16 years. They spent a total of $130 million in the cycle.